Epinephrine use in cardiac arrest is controversial1,2. Despite patho-physiological arguments3,4 that it can improve brain perfusion and even that it may improve the rate of ROSC (Return of Spontaneous Circulation) many have expressed the concern that this does not then translate into real survivors to hospital discharge or to those who have survived WITH a good neurological outcome5,6. Work done here in Manchester over 30 years ago questioned the utility of giving epinephrine to patients who already have supranormal levels of endogenous catecholamines as a result of the cardiac arrest itself7. Epinephrine has been around for years a s component of ALS guidelines for the management of cardiac arrest in shockable and non-shockable rhythms. Indeed it is the first line drug for all forms of adult and paediatric cardiac arrest. Failure to give it at the correct dose and at the correct time will no doubt fail you in your annual review of competence in cardiac arrest management. This is despite little evidence for the effectiveness of Epinephrine in systematic reviews, observational studies meta-analyses8–10. There is uncertainty then in whether we should continue to use Epinephrine in cardiac arrest, and so we are delighted to see that the long awaited PARAMEDIC-211 trial is published today which will hopefully answer the question (Ed – which is a surprise in some ways that we’ve never really tested this before). The abstract is below, but as we always say, please read the full paper (which is open access at NEJM for the moment). You should also read the excellent editorial by Callaway and Donnino12. It’s an RCT, the appropriate design to test an intervention such as the use of a drug in cardiac arrest. Tell me about the patients and what they did. The researchers recruited adult cardiac arrest patients in the UK over roughly 3 years (2014-17). The study screened over 10000 patients in order to recruit 8103 who were randomised into the trial. Randomisation took place if initial CPR and defibrillation was unsuccessful (this makes sense as you would not be giving epinephrine at that stage anyway). Patients either got placebo or they received 1mg boluses of epinephrine according to standard ALS guidelines. The full protocol has previously been published13. The primary outcome was survival at 30 days. This is a good hard end-point in a trial of cardiac arrest, but a key factor in this trial is how that relates to secondary outcomes such as neurological function. The authors worked with patients in the trial design and interestingly (but perhaps not surprisingly) patients valued a positive neurological outcome more than simply survival. The measure of neurological outcome was the Modified Rankin Scale14, with a cut off of 0,1,2,3 being described as a positive neurological outcome. At this point it’s worth reminding ourselves of the MRS levels. 1 – No significant disability. Able to carry out all usual activities, despite some symptoms. 2 – Slight disability. Able to look after own affairs without assistance, but unable to carry out all previous activities. 3 – Moderate disability. Requires some help, but able to walk unassisted. 4 – Moderately severe disability. Unable to attend to own bodily needs without assistance, and unable to walk unassisted. 5 – Severe disability. Requires constant nursing care and attention, bedridden, incontinent. The MRS is a bit blunt in terms of outcomes and perhaps does not give us the full picture of neurological disability, but most would agree that the 3-4 split is a reasonable point at which to divide outcomes (Ed – and this is a common split point in other trials too). So what were the headline results? In terms of the primary outcome of death then there is a statistically significant advantage to epinephrine use, albeit a small one clinically. At 30 days, 130 patients (3.2%) in the epinephrine group and 94 (2.4%) in the placebo group were alive (unadjusted odds ratio for survival, 1.39; 95% confidence interval [CI], 1.06 to 1.82; P=0.02. So we should all use epinephrine then? With a number needed to treat of 112 it’s up there with several other interventions that we advocate in critical care. However, the increase in survival is not quite what it seems as the increased number of survivors appears to be at the expense of an increase in the number of poor neurological outcomes. There was no evidence of a significant difference in the proportion of patients who survived until hospital discharge with a favorable neurological outcome 2.2% vs. 1.9%. Neuro function was assessed at 3 months post arrest. At the time of hospital discharge, severe neurological impairment (MRS 5 or 6) was more common in the survivors in the epinephrine group than in the placebo group 31.0% vs. 17.8%]. In fact although the groups were fairly even at randomisation the effect of this is that in the epinephrine group there were 39 patients with an MRS 4-5 as compared to 16 patients with an MRS in the placebo group. In other words the epinephrine arm returned an additional 23 patients with severe neurological disability back into the community. The numbers for positive outcomes are 74 in the placebo group and 87 in the epinephrine group (this is not significant statistically speaking). Some might argue that this is a pro:con result. 13 more good quality survivors in exchange for 23 severely neurologically impaired. Now the stats don’t support such a simplistic approach, but I place it here as that’s what some have suggested in social media. Looking at the graphic tweeted out from NEJM shows where the divisions fall, and it really does look as though the additional survivors are significantly disabled, and even those with a positive MRS result as deined in this study are largely confined to the MRS score of 3. The authors adjusted for a range of factors that might have influenced the results (e.g. bystander CPR, times, post ROSC care etc.) but found no significant influence from these. I would also draw attention to the very low rates of success in the UK for out of hospital cardiac arrest. Roughly 3% of patients with OOHCA are alive at 30 days. There is a message there that we can do so much better (Ed – and arguably that the pre-hospital, and in particular the pre-arrival phases are under resourced). However, as Rob points out in the comments below, this is arguably because they randomised AFTER those who survived with defib/simple CPR (so the overall figure is likely much higher – thanks Rob). This is another trial that gives us great evidence, but yet more questions. The answer as to what to do is complex and may be influenced by your beliefs, attitudes, the health economy you work in and the society you serve. Let’s think about some pros and cons after this trial. I’m happy to add more if you suggest them. There may be subgroups here who might benefit. All life is precious and we should aim to preserve it. Hang on! This is not the right way to give Epi. If we gave it by infusion in the right patients……. Patients have told us that adverse neuro outcomes are worse than death. The financial burden of increased numbers of disabled patients is unsustainable. The increased pain on families of seeing someone die slowly or remain disabled is to be avoided. 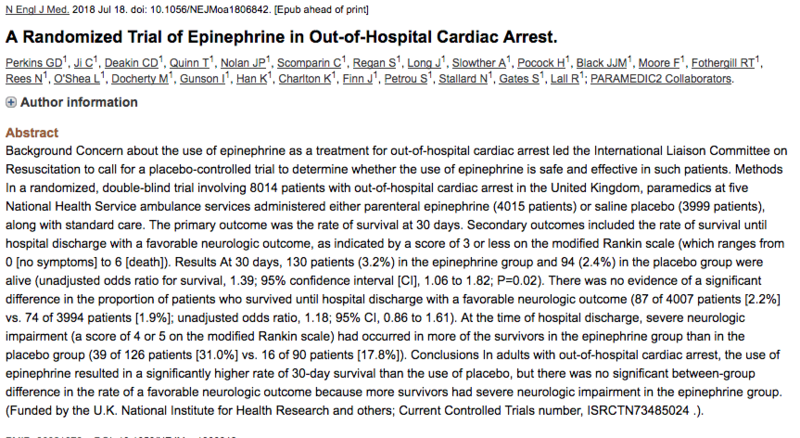 "Not declared dead in ED" – 614 (15.3%) in adrenaline group, and 290 (7.3%) in placebo group. More than double the number of potential organ donors. Should cardiac arrest trials start reporting organ donors as well as death? In Virchester, and in taking the above into account, I think that on balance the argument for giving epinephrine is weak. However, I don’t think it’s a decision that is easy or clear cut and I’m happy to follow international guidelines as and when they change. What I think is important is that we once again see that fancy drugs may not be the answer and perhaps we need to re-emphasise those elements that we know do work such as effective and early CPR and defibrillation. The twitter reaction to the trial has been interesting. Lots of people state that this trial tells them what they already knew. That makes no sense to me at all as we clearly did not know the answer before the trial was done, it may be that it reinforced people’s beliefs, but that’s not the same at all. Similarly those who state that we need to stop using Epi, or that we can reduce doses, are also perhaps jumping the gun here. There are arguments on both sides of the debate that may be subject to more than just the neuro outcome data here and so as Aiden describes, be cautious about what you think this tells us about future practice. I’ve seen >15 people discuss the #paramedic2 trial results today and suggest that this means we should use reduced adrenaline doses. To which I ask, where exactly is the evidence to support this? Lastly, a thank you from all of us to the authors for delivering a high quality trial in emergency care. This was no small undertaking and the design, delivery and oversight here looks to be a huge endorsement of the importance of pre-hospital research and evidence of just how far pre-hospital research has come on in the UK over the last decade. We anxiously await more from UK prehospital researchers soon (look out for AIRWAY-215). 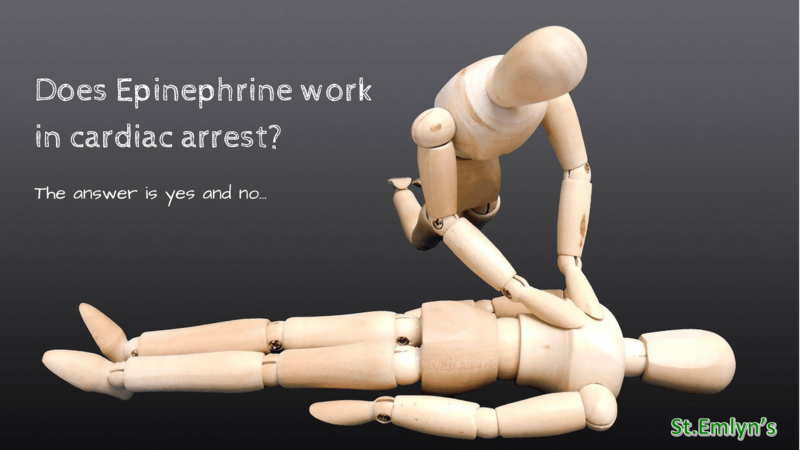 Beyond ACLS: Epinephrine in Out-of-Hospital Cardiac Arrest Poll – R.E.B.E.L. EM – Emergency Medicine Blog. R.E.B.E.L. EM – Emergency Medicine Blog. http://rebelem.com/epinephrine-in-out-of-hospital-cardiac-arrest-poll/. Published March 16, 2015. Accessed July 19, 2018. Episode 96 Beyond ACLS Cardiac Arrest – Live from EMU Conference 2017. Emergency Medicine Cases. https://emergencymedicinecases.com/beyond-acls-cardiac-arrest/. Published May 23, 2017. Accessed July 19, 2018. Home page. AIRWAYS -2. http://www.airways-2.bristol.ac.uk/home/. Published 2017. Accessed July 19, 2018. Just a small point – the particularly low rate of survival to discharge after ohca here/in this paper (3%) would presumably be related to them having excluded patients who achieved a ROSC before drug therapy was started (ie before 3rd shock or IV access), and so the total survival to discharge over the trial period is probably higher? Good point. I’ve added that very important info into the blog and acknowledged your input. Thanks ++ for clarity on this. I had a look at some BHF data which suggested an overall success rate of 8%. That would suggest that most of our survivors are from early interventions as you describe. That figure (8%) is considerably lower than other health economies. Oh yeah, absolutely – lots more work to be done, especially on the pre-hospital and pre-pre-hospital side of things! Great summary of an important trial. I agree, and in that respect I am somewhat surprised that neuro outcome was not the primary outcome. Another interesting (to me at least!) question is whether this translates to in-hospital resuscitation. There’s always a risk that giving adrenaline was a distraction from other interventions in the pre-hospital phase, which might not happen in hospital where there are often more members of an arrest team. Not necessarily convinced by the argument, but might also need to be considered. Tricky to know. I guess it depends on whether you think the setting is more influential than the condition. For me I think (in the absence of better data) I would apply this knowledge to in hospital arrests, but that is a judgement rather than a fully informed EBM decision.